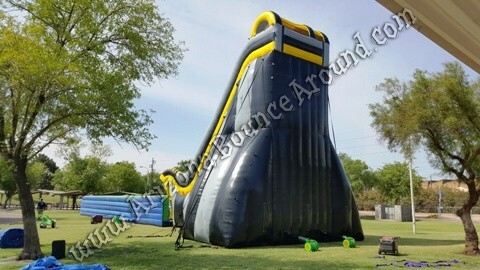 Our new 43 foot tall "Over the Edge" water slides are the hottest things going at summer events by sending the sliders down an amazingly tall fast slide then flying over the edge landing on Zero Shock stunt bags, the same landing bags found on our 51 foot tall Skyscraper, Stunt Jump Tower and Cliff jump slide. 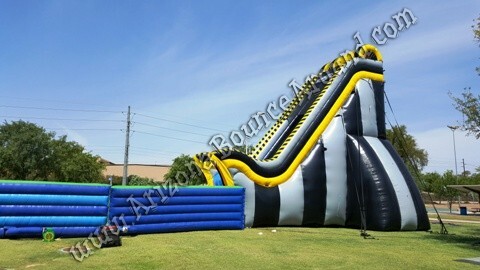 We have 2 of these amazing water slides available for rent so we can put them side by side for twice the output at events. 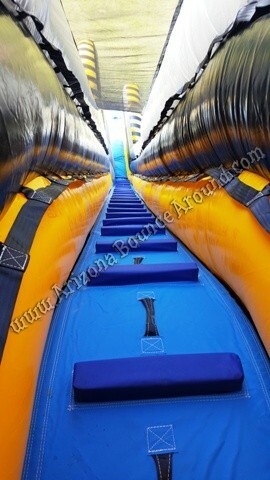 We offer these slides with the stair case either on the right or left side. This is a big plus when putting them side by side so the stairs are on the sides and both landing bags in the middle. It's also great if you plan on having this slide at a residence or place with limited space. Being able to have the stairs on a certain side lets you control where the people enter for better supervision and use at some events. Please let our reservasions agent know if you prefer the stairs on the left or on the right. We only have 1 of each so if the one you want is not available we can't switch the stairs on the other as they are attached to the slide and can't be moved. We will have more photos and video posted here soon but enjoy the video of our Skyscraper slide below to give you an idea of how this slide works. We are the leader in big water slide rentals in Colorado and have more big water slides in stock than anyone in Colorado, California, Nevada, Utah or New Mexico. 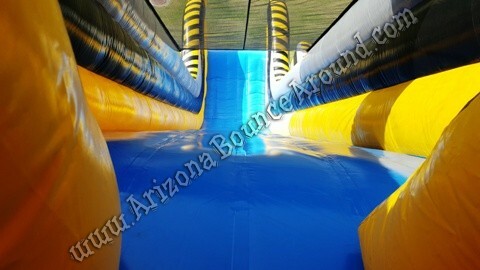 We have years of experience with big water slides for city events, graduation parties, festivals and private events. Call one of our special event planners today to start planning your summer event now before all the big water slides are rented for your event date. We offer full staffing, event management and event security all under one roof since 2002.